Car crash theatre. 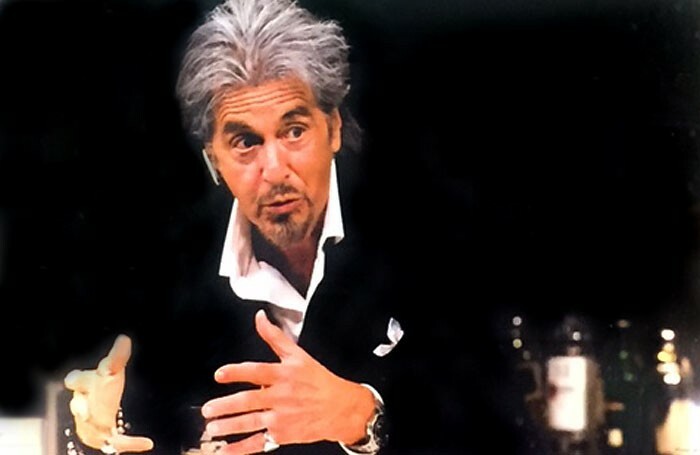 That’s how a colleague described Al Pacino’s return to the Broadway stage in David Mamet’s new play, China Doll. For those who may not have been following the story, Pacino’s return to Broadway has been blighted with problems – most notably, reports that he cannot remember his lines. Teleprompters have been installed around the stage and Pacino wears an earpiece, even after the production’s opening was delayed. Pacino is not the only star on Broadway this season getting help with his lines. If reports are to be believed, Bruce Willis in Misery is also being given a helpful prompt or two through an earpiece, as are Cicely Tyson and James Earl Jones in The Gin Game. However, Pacino seems to be the main focus of press criticism and a large part of me feels sorry for him. Undoubtedly, he is under intense pressure – despite past success on Broadway, he is in danger of being remembered best, if not most fondly, for China Doll. The sign outside the Schoenfeld Theater quotes a line from Pacino’s character in the play: “Can you just tell me what’s happening?” In the circumstances, it seems both ironic and ill-judged. Meanwhile, around the corner at the St James Theatre, the comedy musical Something Rotten has put up a cheeky, if somewhat venomous, sign on its canopy, saying: “All actors promise to memorize most of their lines”. For any actor, it is terrifying to think that one day, no longer being able to remember your lines, you may not be able to work. The interesting point about this situation is that the media have been far more forgiving of other actors: Tyson and Jones have been treated as beloved national treasures. At 90 and 84 years old respectively, they have a few years on 75-year-old Pacino and therefore it’s may be understandable that they require prompts. A similar response greeted Angela Lansbury who, in Blithe Spirit on Broadway and in the West End, wore a cleverly designed hat which incorporated ear pieces. Despite criticism of Pacino’s use of prompting devices, China Doll has not seen a slump at the box office. Audiences seem to be happy to pay top-dollar ticket prices to see their favourite stars on stage whether they know their lines or not. Does this mean we accept that teleprompters and earpieces will become inevitable in theatres? Has a precedent has now been set for Hollywood actors to slip into a play during a gap in their moviemaking schedules believing they don’t need to spend time learning lines? Will audiences continue to tolerate this because of that star’s status and the opportunity to see them live? China Doll is – on paper – a hit show, with its headline star bringing in high weekly grosses that will likely see the play recoup. But in the long term that should not be the only way to judge the success of a production. Phil Willmott: Is Brecht still relevant?